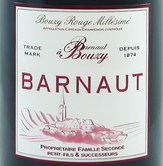 Very typical of the region, its development makes it a “Bouzy that will improve with age”. will be refined and eccentric with a red fruit tart, with which it’ll open out liveliness and common aromas. greatest maturity. Selective screening on the bunch. Made entirely from Pinot Noir. After an "extremist" 2003 , the 2004 campaign took place smoothly, in perfect continuity climate particularly favorable to the vine and wine. Despite a relatively dry start to the season , the vine has benefited of a rainy August . Water stocks have recovered . To conclude, a peaceful climate , without excess with rare and limited climatic accidents, drought began early and consistent with the thermal balance decade . 2004 vintage : This is too good ! Mildew had appeared at the end with the rains in mid -August and remained very localized attacks . Powdery mildew posed a little more problems. The year was marked by big healthy grapes with record weight : 200 g for chardonnay and pinot black. Botrytis , sworn enemy , was not present this year. In conclusion on this vintage , a very mature and honorable crop. During this period, the sun entered the hearts and musts in tanks with a big and beautiful harvest. Alcohol level (% vol. ): 12.0% % vol. Uncork one hour before tasting. Serve at cellar temperature. Aspect : red, quite strong colour. - Bouquet : very ripe red fruits, slightly woody despite the absence of a cask. - Palate : clean, rich, both lively and full, fine tannins present yet discreet. Fromage frais (i.e fresh slabs), soft cheese with flowery rind like Brie and Camembert - Fish with red wine, fish with parsley - Raw meat, pâtés, meat with sauce, meat terrines, organ meats, cooked and cured meats, poultry with sauce, grilled meat, pork. Desserts with fruit base.